An annual cross-country marathon was held at SMK Bandar Utama Damansara (3) on the 3rd of March. More than a 1,000 students — divided into three categories each of boys and girls — participated in the event. Class 1 was for Remove and Form 1 students; class 2 consisted of Form 2 and Form 3 students: while Form 4 and Form 5 found a place in class 1. 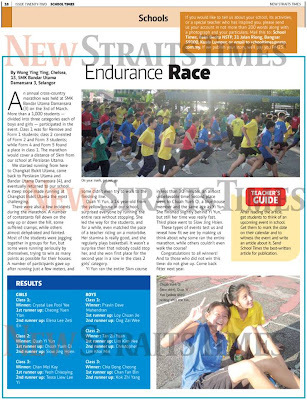 The marathon would cover a distance of 5 km from our school at Persiaran Utama. We started running from here to Changkat Bukit Utama, came back to Persiaran Utama and SMK Bandar Utama Damansara (4) and eventually returned to our school. A steep slope made running at Changkat Bukit Utama the most challenging. There were also a few incidents during the marathon. A number of contestants fell down on the way up or down the hill, some suffered cramps. while others almost dehydrated and fainted. Most of the students were frogging together in groups for fun, but some were running seriously by themselves, trying to win as many points as possible for their houses. A number of participants gave up after running just a few metres, and some didn't even try walking to the finishing line. Quah Yi Yun, a 14-year-old from the yellow house surprised everyone by running the entire race without stopping. She led the way for the students, and for a while, even matched the pace of a teacher riding on a motorbike. Her stamina is really good, and she regularly plays basketball. It wasn't a surprise then that nobody could stop her, and she won first place for the second year in a row in the class 2 girls' category. Yi Yun ran the entire 5km course in than 30 minutes, an almost unbelievable time. Second place went to Chuah Yueh Qi, a blue house member and the same age as Yi Yun, She finished slightly behind Yi Yun. but still her time was really fast. Third place went to Siow Jing Hsien. These types of events test us and reveal how fit we are by making us think about why some ran the entire marathon, while others couldn't even walk the course? Congratulations to all winners! And to those who did not win this time: do not give up. Come back fitter next year.